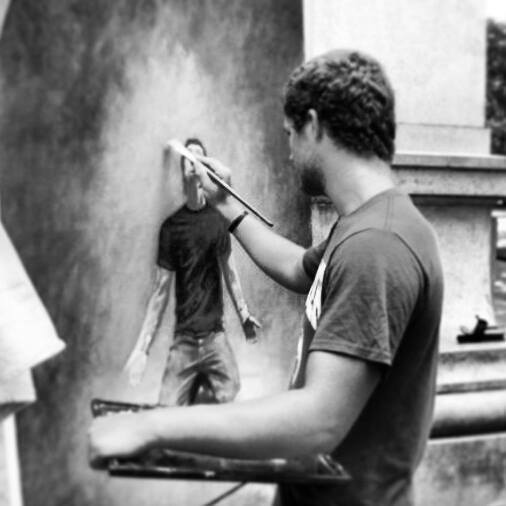 In the summer of 2010, Tucker Rodkey was invited by his art teacher Ryan to come paint in a park in Philadelphia and use their paintings to share the Gospel. Tucker responded "No." Tucker was terrified of sharing his faith and the last place he wanted to evangelize was in a park in Philadelphia. 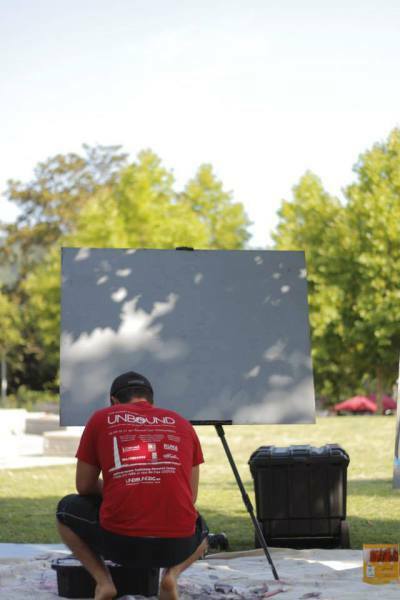 Ryan convinced Tucker to come and that afternoon they setup their easels and began working on their artwork. Tucker found that sharing the Gospel was easy because people wanted to know more about the artwork. 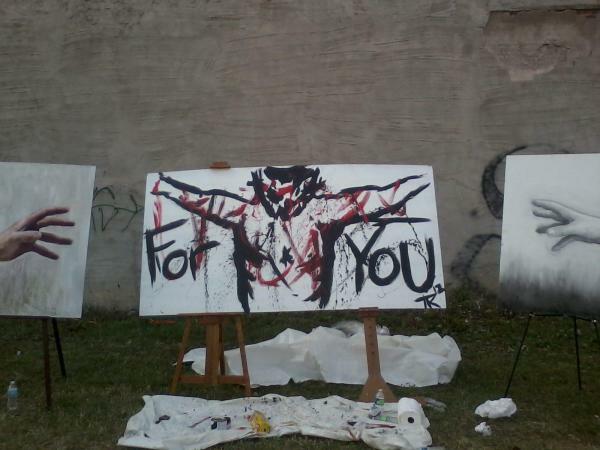 From that moment on Tucker had a fire set in his heart to use art to spread the Gospel of Jesus Christ. Tucker then traveled to Murrieta, CA for a pastors conference and while sitting around the campus lake God downloaded a vision for Painting Freedom into Tucker's heart. He began to see how live art, music, spoken word and more could be used to share the Gospel with people. It wasn't until this day that Tucker really had a clear vision for what Painting Freedom could truly be. Then in the summer of 2012 Tucker was on a missions trip with his church in Chester, PA. They had planned to do a large barbeque outreach at the very end of the week. While they were preparing a friend turned to Tucker and told him that he should do the live art presentation that he had been thinking about for a year now. Tucker said "No." There wasn't enough time! But Tucker's friend pressed him and Tucker gave in. A friend drew one hand in pencil and Christine Uzele drew another hand in color representing God reaching out for us. Then that afternoon, Tucker painted a picture of Christ crossing the gap between God and man. He then preached the Gospel to everyone standing there. He was 17 years old. Tucker's spirit was on fire with the truth of the Gospel after the Chester outreach. And then his world collapsed. His family was broken, relationships destroyed and Tucker was crushed. 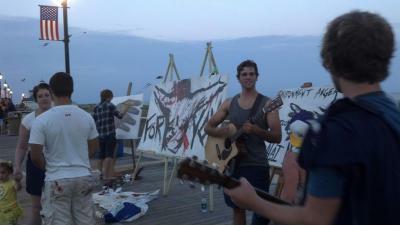 But he had already planned on doing an outreach at Ocean City, NJ so he continued. After setting up, painting and sharing the Gospel a young girl came up to Tucker with tears in her eyes. She shared how she had turned her back on God and run away from him. But She now knew that God loved her and she renewed her relationship with Him. Tucker asked to pray with her and in that moment realized that God had a bigger plan than the pain he was experiencing. Painting Freedom was bigger than just himself. God had used the most horrible situation in Tucker's life to bring about the birth of this outreach organization. Tucker's vision was renewed. Tucker proceeded to do events at churches, schools and of course... the boardwalk. He went off to college and didn't paint for nearly two years. Then while on a mountain in Colorado, God gave him a vision for Take the Coast 2014. He began fundraising and planning a three month missions trip to the entire East Coast of the United States starting in Key West, FL and finishing in Nashua, NH. Over the summer of 2014 God provided for Tucker every day and used his passion and art to share the Gospel with thousands of people. After Take the Coast, Tucker had no idea what to do with Painting Freedom. Over the next two years he painted sporadically at conferences, churches, schools and more. The events were few and far between and Tucker didn't want a ministry built around himself. 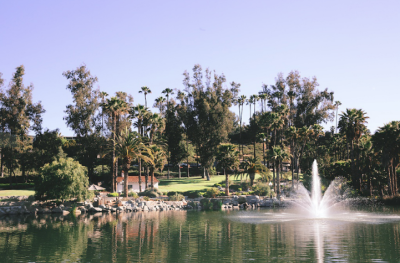 Then while at a Pastors Conference at Sandy Cove, MD, God spoke to Tucker's heart and impressed upon him the need to formalize Painting Freedom and build the ministry. Tucker began talking to his mentors and proceeded to officially found Painting Freedom Ministries. The board of directors came together to lead the ministry while the creative team formed to design the presentations that went to churches, conferences, etc. Tucker is now the Executive Director of Painting Freedom and the rest as they say, is history.